I have not been keeping this a secret all this time. I started putting this information online at my own website in December 2002. 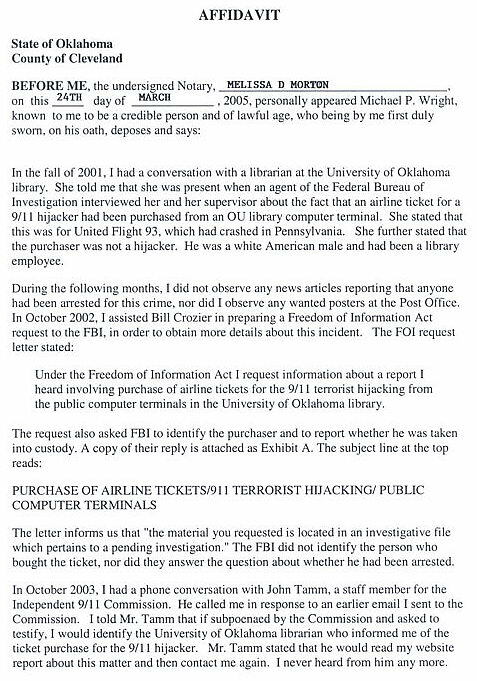 In the fall of 2001, a librarian at the University of Oklahoma in Norman (OU) told me that she was present when the Federal Bureau of Investigation (FBI) conducted an interview about the fact that an airline ticket for a 9/11 hijacker was purchased from a computer terminal at that school’s library. She said it was for United Flight 93, which crashed in Pennsylvania. This is very important. The purchaser was not a hijacker. He was a white American male and a temporary library employee. Apparently the FBI already knew the IP address of the terminal, and with that evidence librarians were able to locate it in the facility. The librarian speculated that he was a neo-Nazi who shared Al-Qaeda’s hatred for Israel. Months passed, and no one was ever arrested for this. I began to suspect that the purchaser was a covert CIA operative infiltrating Al Qaeda, and that immunity from arrest was quietly arranged for him later. In response to Freedom of Information Act requests, the FBI has refused to identify him and will not answer the question about whether he was arrested. They have stated that the requested material "is located in an investigative file which pertains to a pending investigation." It occurs to me now that, if my suspicion is correct, they are relying on the 1982 Intelligence Identities Protection Act as justification for not answering my question. If he were indeed a CIA operative and still alive, then Americans do not need to know his name (but I actually suspect that he is dead.) We do deserve to know whether he was a covert operative. If I am correct, then he clearly crossed a terrible boundary from legitimate surveillance to active participation in a horrendous crime. The U.S. Congress and the public deserve the opportunity to scrutinize this kind of "surveillance." It obviously was not effective in obstructing the 9/11 attack. On the contrary, it facilitated it. 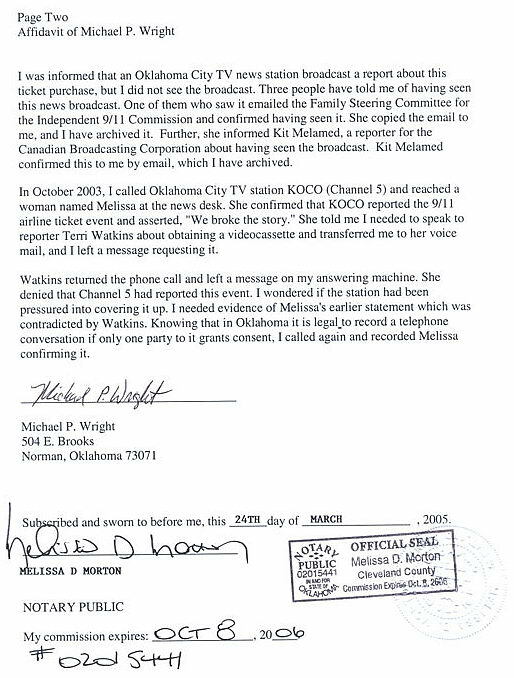 Four different people have told me of seeing an Oklahoma City KOCO-TV news broadcast about the ticket-purchasing incident at OU. In October 2003, I called KOCO and tried to buy a videocassette of this broadcast. A woman at the news desk named Melissa confirmed that they had reported this, and then transferred me to the voice mail of Terri Watkins, the reporter who made the broadcast. I left a message there asking to purchase the videocassette. Any resident of central Oklahoma who is willing to confirm having seen this suppressed news broadcast is encouraged to contact me. It may be necessary to enlarge scans with the mouse. Not every personal computer maintains it’s own IP in a computernetwork! But nice try. I use the University of Oklahoma computer network quite frequently, and I happen to know that every workstation there has its own unique IP address. For example, at this workstation it’s 129.15.104.87 . Now, go to the WHOIS database search and enter that number — http://www.arin.net/whois/ It will identify the University of Oklahoma. Try another address: 129.15.104.29 . You’ll get a different OU workstation. As you say: "nice try." You appear to have an interest in discrediting my work. Would you care to identify yourself? By the way, I forgot to put my email address in the article. It’s mpwright9@aol.com — Michael P. Wright, Norman, Oklahoma. Good on you. Keep up the good work. The truth will be known. That’s a convicing and powerful article. Wow. There’s a lot about 9/11 that is too bizarre to be allowed to be brushed under rug. Thanks for bringing this to the people! Good — But how come those messages have been posted on August 1 at 5 or 6 in the morning when it’s only about 1 a.m. here on the west coast? Is this GMT or what? Is tgis an OH mail list or what ! of your Al Capone gov ! I just finished a short course in networking. Guest what, we had at least 10 computers. All had a different IP address. This was a basic course. I have experimented with a private network 10.0.1.0 of 4 Apple computers. The AirPort Extreme Base Station had IP address 10.0.1.1 acting as a rouiter. The PowerBook had 2 addresses 10.0.1.2 for ordinary ethernet, and 10.0.1.3 related to AirPort network. The other 3 computers had addresses respectively 10.0.1.4 to 10.0.1.6 using DHCP manual configuration. Correct you are but that is why we have DHCP logs if it is not statically assigned. The ticket purchaser sounds like Nick Berg. Supposedly killed by jihadis in Iraq. Nick Berg it was. He’s alive and well in I$rael. Even if a computer does not have a static IP number, it has a DHCP address which is given by the router it is attached to. This router has a routable i.e. a static IP address which is assigned and easily traceable. Who ever posted the message about not having a static IP has no clue what they are talking about. They are probably a totally misguided W fan who cannot face reality so comes up with every possible excuse, no matter how ignorant, to stand behind his Hitler. I am a BSEE with 20 years experience in building the internet out for some of the biggest corporations in the world as well as DoD. 1. Most people do not use routers for DHCP. They use servers. Either a Windows server or Unix server. Only a small network would use a router for DHCP. 2. Yes, a router might have an outside IP address that can be traced back to the router, but that’s it. If the hosts behind the router are being assigned addresses in the private IP space (ie. not routable over the internet), then there will not be a one to eon relationship between the LAN hosts and the internet. You could literally have hundreds of machines appearing to come from the router’s IP address thanks to NAT. I know that’s what we do where I work: One valid internet address per every 200 or so machines. On that LAN a host might be 10.10.6.52 and another might be 10.10.6.21, but on the internet they would appear as 66.5.213.4 (just a random example for the outside IP). 3. Just because someone corrects technical misunderstanding made by an anti-Bush person, doesn’t make that person pro-Bush. I’m anti-Bush myself, but I really don’t like to see people living with misunderstandings about technology. 4. I work in a public sector job where we provide internet access to students. I can tell you that when we first started, we DID use real internet addresses for every machine on the network back in the early 90s. But as we learned more abour security and the number of machines grew, we found this to be untenable. We moved to NAT so that we could increase the number of machines inside while still only utilizing a handful of real internet IPs on the outside. It sounds like OU doesn’t do this, which is fine for them as they are probably a small institution. Don’t continue to perpetuate ignorance. And if you truly have worked for 20 years in the field and are a BSEE, then you might want to go back and read some books because your knowledge is currently lacking. Why do you say that it sounds like Nick Berg? That’s an intriguing idea, especially considering that there were some connections between Berg and Zacharias Moussaoui (e.g. they both attended the same flight school in Norman, and Moussaoui sent emails using Bergs account) Within the article, however, I see nothing that would suggest berg as the mystery ticket purchaser. An interesting aside: the co-pilot in the Paul Wellstone crash was aquainted with Moussaoui - he attended flight school with Moussaoui in Minnesota, and Moussaoui used (and copied) his 747 flight simulator software. I’m not suggesting anything here, but its odd. Berg may have been killed in Iraq, but not by jihadis. Once one questions who is responsible, the available evidence (the videos) points to an American driven "black ops" scenario. There is too much data to give here, but if one follows up what may remain "unscrubbed" at various sites (Fintan Dunne and others) there is a mass of evidence that points to the murderers as Western. Some of that evidence is morphological, some is cultural and only quickly noticed by Muslims. Regardless, when the number of inexplicable elements hovers around fifteen or more, the story begins to crumble. Actually, a single cite from our own goverment should suffice. It was the US that so quickly Id’ed the "beheader" as Zarqawi, but since the man with the blade would have had to have vaulted the white Walmart type plastic chair, that pretty much rules out the guy the US Id’ed as Zarqawi, as Zarqawi has a full leg prosthesis on his right leg. And that is only important if one if one dismisses the still unrecanted claim by US Intelligence that Zarqawi was killed by a missle attack on his base about two months prior to Berg’s death. The real question about Berg is what did he know and when did he know it? On May 13, it was revealed that Nick Berg had been investigated during the U. S. government’s investigation of Zacarias Moussaoui. Berg’s email address had been used by Moussaoui prior to the September 11, 2001 attacks. According to Berg’s father, Nick Berg had had a chance encounter with an acquaintance of Moussaoui on a bus in Norman, Oklahoma. This person had asked to borrow Berg’s laptop computer to send an email. Berg gave the details of his own email account and password, which were later used by Moussaoui. While attending a course at a remote campus of the University of Oklahoma near an airport, Nick Berg gave his email account and password to a student on a bus who may have been an acquaintance of Moussaoui . That email account was later used by Zacarias Moussaoui, a 911 suspect who attended flight school in Oklahoma in February 2001. Mr. Berg was unaware the person had terrorist ties. The director of The University of Oklahoma, that Berg attended, is David L. Boren, mentor of CIA director George Tenet. Lt. Bruce Chan of the university police at the Norman, Okla., campus, said yesterday by phone that Berg was busted twice for apparently living at the student union center - after he was no longer enrolled as a student. Chan said that, after receiving complaints from staffers at the Oklahoma Memorial Union that Berg was camped out there, police issued a warning and then twice arrested him for trespassing, a misdemeanor. He said the arrests were in April and May 2000, but Chan didn’t have exact dates. BOTH BERG AND MOUSSAOUI ATTENDED AIRMAN FLIGHT SCHOOL: The Airman Flight School is centrally located in Norman, Oklahoma, and only minutes away from Will Rogers World Airport in Oklahoma City. Norman is the home to the University of Oklahoma; its residents enjoy all the conveniences of a major metropolitan area. Norman averages more than 300 days of VFR weather per year, for year-round flight training. On IFR days, students in advanced courses continue training on instruments. 1) Have you inquired if the "purchaser" was Nick Berg ? 2) I can’t believe someone apparently as aware as you seem to be gives any credence to the existence of "Al Queda" ( or Al Kaydee as some refer to it). 3) Thank you for your efforts in exposing this scam. "The War against the Flintstones" !!! Kennedy was shot by a magic bullet and some patsy went to prison only to be shot himself. Another Kennedy was shot to keep him quiet. You now know Pearl H was a setup. The fact they wanted Kissenger to front the 911 investigation so Bush can finish reading his satanic goat book sent flags everywhere, where does all this get you? By your twiddling thumbs it’s as if you want it to happen all over again. Your bored and want adventure, right! You enjoy being slaves to the nerds in ties and your center of the world belief system. Bush waited in a school when he could have at least peaked out the window to see if the coast was clear. "only one plane hit, OK probably just a coingkeedink anyway, right kiddies." Flip, ohh paper cut! Your silence say’s it all America, we kill so they won’t have too. Take your new world order and shove it up to your eyebrows and when you feel it tickling your brainstem, push real hard OK America. Now go F*#K yourselves and stop hiding behind our Canadian flag I’m sick of seeing your bastards swaggering about ,hiding behind another country when travelling abroad, ya frauds. Keep up the good work. There seems to be an awful lot of evidence on the internet based on TV reports that there was involvement of the I$raeli Mossad in 9/11. I have seen the Nick Berg beheading tapes and they look as phoney as a three dollar bill. So, Berg is probably involved and as one other commenter states is living in I$rael. Those who would jump to Israelis defense should consider the Lavon Affair and the USS Liberty massacre. The I$raelis are not our friends! No bodies of Arabs were ever recovered on any 9/11 site. End of "Arabs did it" story. Israelis impersonated (not surveilled) Arabs in different places in the US before 9/11, including "Atta." Israeli security company ICTS "guarded" the 9/11 airports and God knows who they allowed to do 9/11. Probably Israelis. Will the owner of this website stop insinuating Arab involvement in 9/11? There is no evidence for it. Several of the 19 "hijackers" are alive, their names came from Israel. All make-believe. I’m glad to hear you’re following up on this bizarre story. OU seems to be the nexus of a lot of weirdness. Berg, Moussaoui, Wellstone’s pilot. They’re all connected in some way. And as usual, central Oklahoma’s media refuses to look into these explosive stories. Did Ms. Watkins admit that she was aware of the story? I find it all so hard to believe. Certainly someone in central OK has a copy of that tape. I’ve been waiting to hear more about all of this. Keep up the good work! This information further reveals another light on the relaxed atmosphere during the "downing street memo" meeting and confirms my original belief as to who was genuinly responsible for what occurred on 911. My initial impression was that there was probably some remote control device used to direct the planes to their targets. Finally, the pictures revealed by the mainstream Media showing the so-called terrorist that alledgely commited such acts, could be pictures of deseased individuals. Lastly, the profiling of Blacks still appears to be the Media’s primary concern, objective and agenda. For ex. if anybody doesn’t believe that the new Mexican stamp was adopted through the ideology of the US government and people therewith, then they’ve been overwhelmingly deceived.